Next weekend, I will be taking a workshop on natural dyes with Anni Redding. She will show us dyes using cochineal and osage orange in 3 different depths of shade: light, medium and dark. I plan to dye the squares I’ve woven with the Zoom Loom a while back. Since I plan to overdye some of the samples, if time allows, I wanted to get an idea of what the colors might look like. Since overdying is similar to glazing technique with watercolors, I pulled out 3 colors that are close to the cochineal (quinacridone magenta), osage orange (nickel azo yellow), and indigo (phthalo blue – green shade). 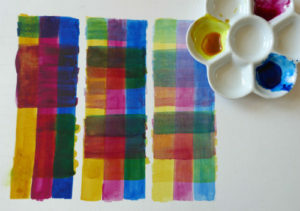 I painted 3 strips in varying depths of shade and glazed over them with additional colors. I pooped out over the darkest shade so they are not correct, but you get the idea. The order in which the glaze is applied does make a difference to the colors. Anyway, fun coloring exercise. Let’s see how they turn out with dyes. Previous Previous post: Indigo in the news!